With the ultimate cinema experience, VOX cinemas is the leader in the concept of luxury cinema. The exclusive VOX cinemas offer breathtaking view and pure indulgence. VOX cinemas proposes latest block busters on the big screen with the luxury of relaxing in a deluxe, fully reclining armchair coupled with delicious gourmet menu options. VOX cinemas features world’s fastest polarization technology which gives brightest, clearest and most immersive 3D experience possible. VOX Cinema’s latest venue in the capital, which opened at Nation Galleria at 3pm on July 16, promises to bring luxury to Abu Dhabi’s film fans. The new venture will house 11 screens, seat 800 people at full capacity and feature four VOX Gold luxury cinemas. Two of the cinema’s standard screens will be fitted with Dolby Atmos for an enhanced audio experience, while VOX Gold customers can look forward to waiter service, reclining seats, and blankets to help with the traditional cinema frost. VIP guests can also look forward to a private lift. To celebrate the launch, VOX is offering cinemagoers who buy a VOX Gold ticket from the opening through until August 15 a host of prizes worth over Dh100, 000 including a VIP movie premiere for 20 friends in a VOX Gold cinema and a stay at the adjacent St Regis Abu Dhabi. The big cinema experience presents the future of cinema entertainment with the launch of 7 VOX cinemas at Al Hamra Mall, Mall of the Emirates, Mirdif City Centre, Deirah City Centre, Fujairah City Centre, Ajman City Centre, Marina Mall Abu Dhabi and Yas Mall Abu Dhabi. The enthralling cinema experience boast a 20m wide screen with crisp and bright digital images ensuring a stunning realistic and fully immersive entertainment experience. 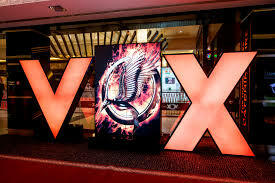 VOX cinemas, launching in Abu Dhabi to show the next generation of high frame rate 3D experience.